For several months, Google has teased some updates for Chrome that aim to make surfing the web slightly less annoying. 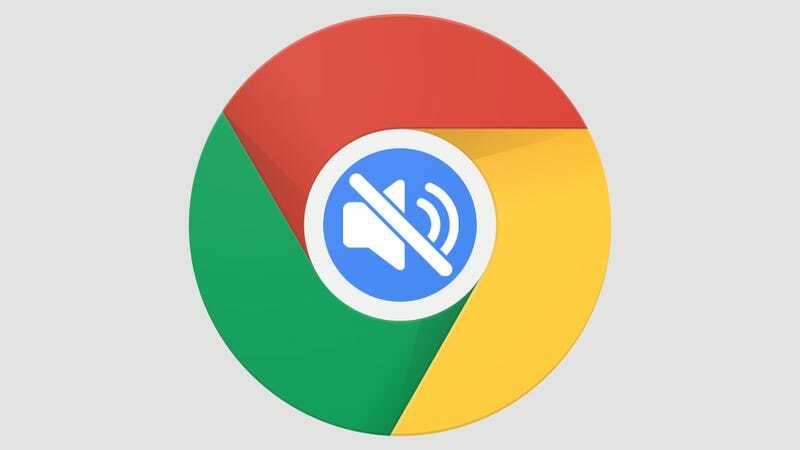 And on Thursday, Chrome developers announced that you can now update your browser and choose to mute those annoying autoplay videos on websites. The update, Chrome 64 beta, also prevents malicious redirects, and a whole lot more. We told you about these Chrome features back in September, and warned that it could have some downsides in the long run. But it seems that some of the changes that were being discussed at the time aren’t in this release. Next to the sound option is another dropdown menu, click that and choose “always block on this site.” And that’s it. You will no longer experience that grating sound of an unrelated video that you never asked for blasting through the speakers and scaring the crap out of the cat. It’s very convenient, and oh so satisfying. In addition to the mute function, this beta release of Chrome comes with an enhanced pop-up blocker that helps sniff out disguised play buttons, links, and other controls. Malicious auto-redirects will also have a tougher time sending you to a site that you never wanted to visit. A user will now see a little info bar that tells them when a redirect is being blocked. Google has also created a helpful portal for site owners to find out if they’re engaging in any of the new prohibited practices. Other new features in the beta release include HDR video playback on Windows 10, a “Split view” feature for Chrome OS, tweaked page resize options for developers, and improved resource usage for media assets. You can see the full list of changes here. As for our concerns in September: They still stand, but Google seems to have slowed down the pace of some of the changes it mentioned were coming. Specifically, Google previously introduced new autoplay policies that prohibit a video from playing unless the sound is muted, or if there’s no sound on the clip at all. A user could still choose to play the video. That doesn’t seem to be coming in this release after all. It’s not a terrible policy, but when taken in conjunction with a Wall Street Journal report from April that claimed Google was in the process of implementing new ad-blocking features by default, it sounded like the beginning of a slippery slope. Google is part of the Coalition for Better Ad Standards, which has a transparent list of ad types that shouldn’t be used. The idea of Google gently insisting that websites avoid those ad types over time is mostly fine. But it’s important to keep in mind that Google controls 42 percent of the US digital ad market and 75.8 percent of the search ad market, according to research from eMarketer. It also controls almost 55 percent of the browser market, according to stat counter. Few consumers are going to cry “censorship” over Google deciding what ads you see, but giving this mammoth company more power over what smaller sites can and cannot display in order to bring in revenue is not a great idea. There’s no reason to believe Chrome won’t continue to dominate the market, and if certain options are on by default, they’ll stay that way. What’s more, Google recognizes that ad-blockers are a threat to its business and most ad-supported businesses on the web. Services like AdBlock plus reportedly take money to whitelist certain advertisers, and handing that ability over to Google also sounds like a terrible idea. No one likes ads, but people like going to websites without paying a subscription fee. Unless we want Google and Facebook running the whole dang internet a certain amount of separation of powers is called for. We’ve reached out to Google to clarify if it still intends to implement the previously reported video policies in the final release of Chrome 64, or in future releases. We’ll update this post when we receive a reply. Republicans Just Sold Out the Internet. Now What?